When you go to a yoga class and attempt to do a forward bend, you are likely to hear: “Bend from the hips!” What does it mean exactly? And is it really the best way to get there? Last week we’ve established that our main intention, when it comes to forward bends, is to stretch the lower back. Unfortunately, the way we GO INTO the forward bend and COME OUT of it can mess up our plans. Here is why. When we go into the forward bend, we basically have three options : “swan dive”, neutral spine, and “nose dive”. All of these refer to the positioning of our lower backs. The request to ”bend from the hips” usually refers to the “swan dive” option. It means that instead of bending from the waist (like you do in a “nose dive”), you choose to lead the movement with your pelvis, tipping it forward first and then following it with the rest of the upper body. The problem is that if your lower back has a tendency to overarch, it will do it here, creating a deep curve that is not supported. As a result you are risking posterior disk compression (oversqueezing your lumbar disks at the back) and creating lower back tension, both because of the excessive lumbar arch. This is more common in extra bendy yoga practitioners, and those who have a lot of mobility in the movement of their pelvis. If instead you take a “nose dive”, bending from the waist and curling your upper body down first, before your pelvis, you end up reversing your natural lumbar curve and putting extra load on the front portion of your lumbar disks and the lower back muscles. This way you are risking anterior disk compression (oversqueezing your lumbar disks at the front) and straining your lower back muscles from pulling on them too hard. This movement pattern is especially common in new inexperienced students. The secret here lies in controlling the relationship between your pelvis and your lumbar spine. We do not want the pelvis to lead the way OR get left behind. Instead, we begin to bend forward with the pelvis and the upper body moving together as a unit. To make that happen, we need to keep the knees soft (4), so that the hamstrings do not get in the way, and progressively contract the abdomen (1), so that we create support for the lower back and control the position of the pelvis. When you do it this way, you end up gradually stretching your lower back from the beginning of the movement to the very end. The chest remains raised at first (2), and then begins to fold down at about half-way. The head remains in line with the spine during the entire movement (3). When you do it this way, the abdominal contraction supports your spine and your lower back like an invisible hand. On the way out of the pose we basically do the same thing in reverse. We lead with the chest first returning into the neutral spine at about halfway up, and then move the upper body and pelvis together to return into standing. If you decide to roll up instead, you will be risking anterior disk compression once again, but this time with an added pressure of moving against gravity (read a detailed exploration of why rolling up is a bad idea). Check out this video of me guiding a student in and out of the forward bend. Moving in and out of the forward bend before holding the pose is a super useful way to warm up the lower back by engaging it (on the way up) and stretching it (on way down). That way we are using our usual contract-relax-stretch principle to increase the blood flow to the area and then make it more pliable and compliant. After that your lower back will be much more willing to hold the pose, and you will get the most out of the stretch. 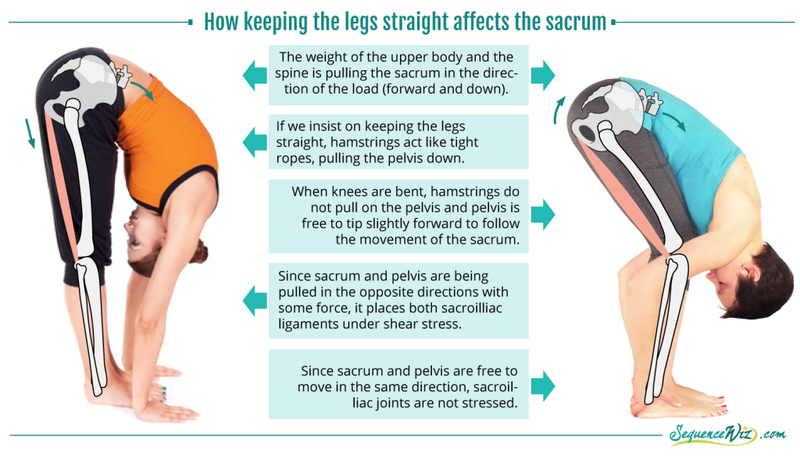 Keeping your legs straight in most forward bends is not advisable, because of the risk of lower back strain, hamstring pull and shear stress on the sacrum. Once we get ourselves into the forward bend, we can do some subtle work to get the most out of it. On the Inhale lift out of the pose slightly and lengthen the spine; on the Exhale gradually contract your abdomen and move deeper into the pose, maintaining this newly found length. 1. Collapsing the chest over the belly. Here once again we are risking anterior disk compression. In addition, this kind of positioning limits our ability to lengthen the spine and get a good stretch along the back of the body. Solution: Bend your knees as much as you need to be able to lengthen the torso along the thighs. 2. Jutting the chin up, which increases the arch of the cervical spine and stresses the neck. It also prevents us from getting a good stretch in the upper back. Solution: Keep your head in line with the spine while moving in/out of the forward bend; once in the pose, put your head down. 3. Excessive rotation of the pelvis might seem like a great accomplishment, but unfortunately here the practitioner often ends up “collapsing” into the hip joints and forgoes the benefits of the forward bend completely. When we consistently tip the pelvis too far forward, overtime we loose stability in the hip joints and make them prone to injury. Solution: Bend the knees – this will prevent the pelvis from rotating forward. The forward bend will not be as deep, but you will get a stretch in the lower back. So there you have it. Forward bends can be very useful for the lower back, as long as we control the relationship between the pelvis and the spine when we attempt them. Using progressive abdominal contraction protects the spine, supports the lower back and strengthens the core. And many things that we’ve come to admire about fancy forward bends, like straight legs and deep folds, often do more harm then good by destabilizing the joints and overstretching the ligaments. So lets forget the extreme versions of the poses and instead focus on building stability and balanced relationships in the body. Next week we will take a closer look at different arm adaptations in Uttanasana and Ardha Uttanasana and explore how we can stretch and strengthen different parts of the back. Tune in! Last week I opened an Instagram account (@ok.yoga) with a purpose of featuring short 15-second videos of different pose adaptations and explaining what they are for. I will be posting those few times a week. If you are on Instagram, please stop by and say hi! I would love to follow you. And if you are not, you can join for free 🙂 Hope to see you there! Great job Olga. I am so glad that you are putting this approach of our training out there. Thank you Georgeanna. It just makes sense! This is wonderful. Your blogs are fantastic and do an excellent job of explaining the Viniyoga concepts. And – your art work is terrific. The most dangerous postures are those one when we bend forward. Your explainatons are good. So clearly worded with a simple explanation of the way to avoid stress on lumbar spine and hamstrings. I think the same wendy heh! Great article. I like the idea of describing how to go into forward bends by numbers shown in the picture, it gives a better understanding of the details. Thanks for making this simple to understand, and for enabling me to have the knowledge to pass on to my students. Namaste. Interesting article. I am new to yoga and trying to understand the physiology behind it and what you say makes sense. Other yoga teachers encourage me to keep my legs straight as I bend forward though, to stretch out my hips and hamstrings. I’m guessing that the whole point of bending knees becomes moot if your core and lower back are strong enough to keep your pelvis in neutral and your back straight, so there is no lumbar spine compression. When you bend your knees, the stretch in your hamstrings are lessened however, you give your back more support and this is probably more important than stretching your hamstrings. In other words, if I cannot do the forward bend pose with straight legs without lumbar spine compression, then I need to bend my knees to make it easier to keep my pelvis and back in neutral and avoid compression, right? Thanks for reading. Hi Olga, thanks for sharing all these great knowledge, really learnt alot! Please allow me to ask a question concerning spinal flexion which i can’t seem to figure out. As you’ve mentioned, it is always advised for people with back issue to avoid spinal flexion(risk of anterior disk compression), but how does this apply in yin yoga where forward bend postures which are meant to stretch the back of spine typically allow the back to be rounded? Hope you could help solve this question mark in my head! Thank you!